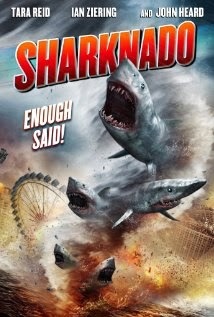 Sharknado is an original SyFy flick that has debuted and struck the Internet with the force of a fresh slap to the face with a, well, a fish. It is both incredibly bad and incredibly fun! The night of its arrival, Twitter went nuts! Sharks fall from the sky and of course, they munch on humans on the way down. People lose limbs. We pull out chainsaws and such.